Every specific installation has a definite set of purposes. The roof and chimney in your home have their specific purposes. Likewise, insulation and weather stripping have their benefits. The plumbing infrastructure, the electrical wiring, sewer and all other specific infrastructure cater to very well defined needs. Should any infrastructure fail to attend to its needs, the problems need to be identified and those must be remedied before it is too late. Just as you should conduct roof and chimney inspection to preempt problems, to conduct preventive maintenance and to avert costly repairs, likewise you must ensure that your sewer lines are in impeccable condition and working optimally. The most effective way to check for problems in sewer lines or pipes and even in typical plumbing infrastructure is sewer smoke testing. Sewers are an integral part of the civic infrastructure of a city, town or even neighborhood. The sewers are designed to carry waste from residential and commercial establishments. While critical for waste management, sewers also ensure that there is no major public health hazard or environmental problem. Sewers don’t cater to rainwater or drainage in the area. It is meant for solid waste. There are segregated drains for rainwater or water runoff from any source. The sewer lines run from the houses and businesses and get connected to the city sewers and eventually to the city sewage plant where all sewage gets treated. Should there be any leaks in the sewer lines, then that would impair the flow of sewage. Also, the leakage may allow rainwater or water runoff from various sources to clog the space inside the sewer lines. This again will hinder the flow of sewage. Leaks would cause sewer gas to seep out. This gas is unhealthy and can become a serious public health hazard. It is also an environmental problem. To check for leaks in sewer pipes or lines, sewer smoke testing is conducted. Sewer smoke testing is a simple process but it requires some deft planning and execution. 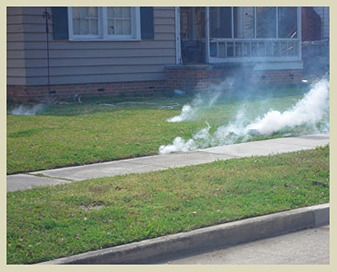 In simple words, smoke is pumped into the sewer lines to look for leaks, the places where the smoke would leak out. In an ideal scenario, the smoke being pumped in at a pressure higher than the atmospheric pressure to facilitate its flow in the intended direction would only leak or dissipate from the rooftop vents. The rooftop vents cater to the specific purpose of the release of sewer gas outside, beyond the breathing and living space of people. Should the smoke leak from anywhere but the rooftop vents, there is a leak and that must be repaired. Sewer smoke testing requires adequate preparation. The area needs to be marked well, the fire department should be notified, the local residents and businesses must be notified too and adequate precaution must be taken to ensure that the smoke doesn’t cause any discomfort to anyone. The smoke used is harmless. There is no toxic component. The smoke would not cause even the slightest of discomfort but since it is a substantial quantum of smoke that is used, it helps to be more proactive than reacting to a chaotic development. As the smoke gets pumped into the sewers, the technicians would observe where the smoke leaks first and all places where the smoke gets out. Accordingly, the repairing schedule will be chalked out and the scope will be determined. Adequate notice would be served before the necessary repairs are embarked upon. Sewer lines suffer wear and tear. The pipes would age and thus become vulnerable. Protruding roots of trees nearby may penetrate the pipes. Various kinds of objects can facilitate cracks, dents or leaks. Pipes can also burst allowing sewage to spread out. All such instances are common and they must be proactively checked. Sewer smoke testing is not confined to sewer lines. It is also applicable for plumbing problems, especially leaks. During sewer smoke testing, if it is found that a particular pipe in the house is where the smoke gets out instead of the rooftop vents or in addition to the rooftop vents then that means you have a leak. While the smoke is visible, sewer gas is not. The leak implies that you have been having sewer gas leak into your home through those cracks and dents in your pipes. You must immediate repair the leak or get the pipe replaced. Sewer smoke testing can be conducted for all your pipes or the entire plumbing infrastructure. Sewer smoke testing is frequently conducted by civic authorities to ensure that the sewer infrastructure is intact and failsafe. As a homeowner or business owner, you must conduct sewer smoke testing or smoke testing for your own plumbing infrastructure and the sewer lines in your property.